*WHO IS THIS OLD MAN? *This did not happen, since it was not of such people who disrupt corporate morale, was not a singer, nor a top model. *Who is this old man than??? 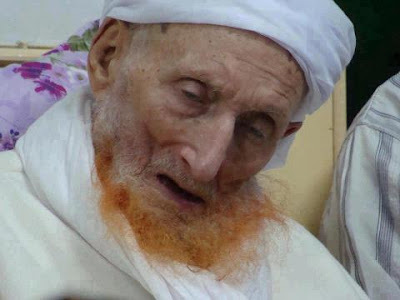 *This is Shaykh al-Al-lamah: Muhammed Al-BAKKALI, one of the greatest Muhaddithins (One who knows all the sayings of Muhammad hadith by heart - or at least 200 thousand hadiths are needed to get this title) in the world. He is from the city of Tanger-Morocco. From this famous hadith scholar learned and graduated more than 1000 scholars of hadith, from Morocco and outside Morocco. He lived 100 years.